You can “claim” land on Altitude to protect your builds. When you claim a section of land, other players will be unable to place or break blocks, kill animals, take crops, or open chests. Everything will be completely protected! To claim land, you will need some basic tools: a golden shovel, and a stick. You can craft these items yourself or do /claim to receive them for free. The shovel is used for modifying claims and the stick is used for viewing claim information. You can create as many claims as you want, however, there is a limit on how many blocks in total you can claim. Players start with an allowance of 500 “claim blocks” and can purchase additional “claim blocks” with in-game currency using /buyclaimblocks. Before creating any claim, we should check if there are other claims by other players nearby. Claims by different people should be at least 100 blocks apart unless both parties discuss otherwise. To do this, hold a stick in your hand and shift + right click to visualize all nearby claims. Claims are visualized using dotted lines of gold blocks, so look around for any dotted lines on the ground around you. Once you’ve confirmed that there are no claims too close, we can begin claiming! All claims are rectangles, so don't worry about the Y axis (height) of your claim, claims automatically expand up and down as you build. Just focus on drawing a rectangle that surrounds your entire home. Get an idea of where the corners of this rectangle should be. Claims will be automatically deleted once the owner of the claim has been inactive for 60 consecutive days. If you are planning to be gone this long, all you need to do is join for a couple of minutes within those 60 days to reset the timer. 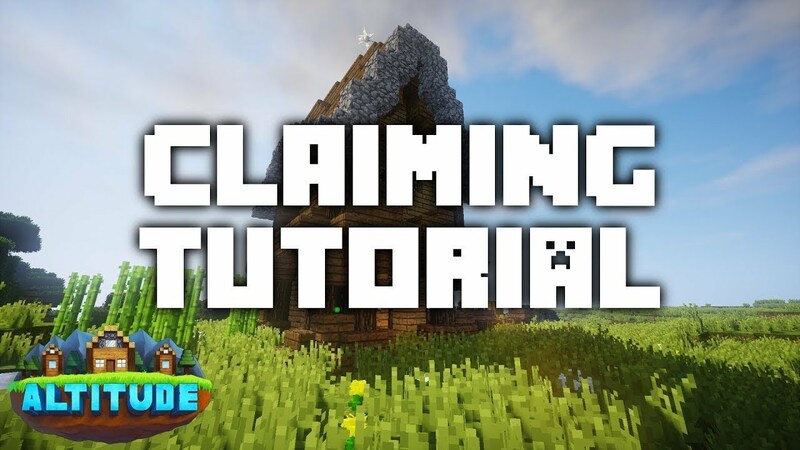 Unclaimed land is fair game to loot, so make sure your claims are active and properly sized! You can make your claim bigger or smaller any time by using a golden shovel. The process is similar to creating the claim. To make things easier, start by right clicking within the claim with a stick. This will show the border of the claim so you can see where the corners are. To resize a claim, right click a corner you would like to move. Then, right click again wherever you would like to move that corner to. To make things easier, you don't need to right click the actual block, you can just point your crosshair at the block and right click from a distance. Subdividing claims allows you to give players access to specific parts of your claim. This is the best way to manage a town or shop! ​​To create a subdivision you need to go into "subdivision mode". You can access this mode with /subdivideclaims. Once you are in this mode you can create the subdivisions the same way you would make a regular claim, just right click two corners. Subdivisions will be outlined with a white dotted line. To leave subdivision mode use /basicclaims. You can add other players to your protected area with various levels of access. To trust everyone on the server replace <player> with "all". This works with all of the commands below.